It's normal for English mastiffs to produce lots of drool. Make no mistake, English mastiffs are droolers. All breeds with loose, pendulous lips are prone to doing it. But if you notice a sudden increase in the amount your slobbery dog drools, it’s essential to investigate -- hypersalivation can be a sign of an underlying health or psychological problem. Food anticipation is a common cause of drooling for all dogs, but your English mastiff is less capable of keeping that drool inside his mouth due to the looseness of his lips. Other causes for drooling include nervousness, excitement and even travel sickness. By normal dog standards, an English mastiff drools excessively. However, only you as owner will be able to tell if your pet is drooling more than normal. If you suspect your dog is drooling more than usual, look for other symptoms, both physical and behavioral that may point to an underlying problem. For example, if your English mastiff is off his food, this is potentially a sign that his drooling is linked to a dental problem. Anxiety is a common cause of excessive drooling. No dog should suffer from anxiety, but anxiety in an English mastiff is particular cause for concern, as the breed is typically a confident and docile one. However, if left alone for prolonged periods of time, the English mastiff certainly is at risk of becoming anxious, due to his strongly held desire to be with his people. If your pooch has recently undergone a change to his routine, this may be the cause of drooling. 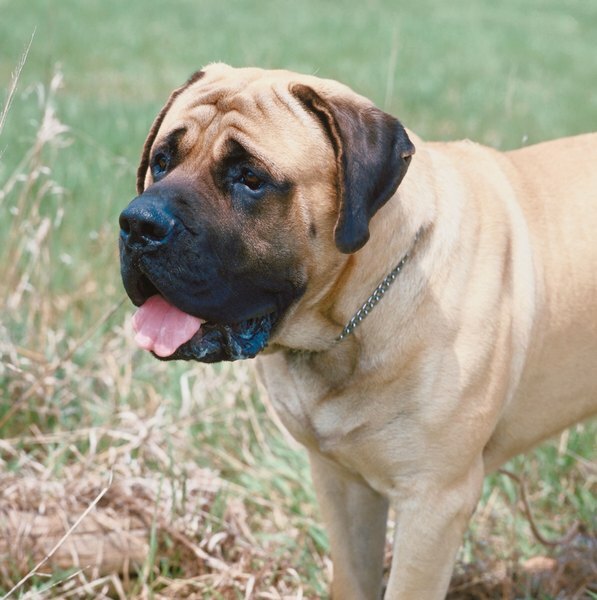 English mastiffs are susceptible to heat stroke, which can cause hypersalivation. Never leave your dog outside in hot weather without access to shade and a constant supply of fresh, clean water. 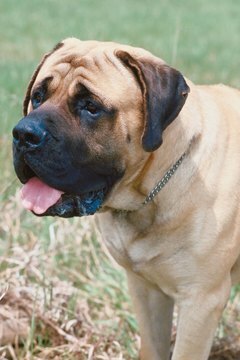 English mastiffs are thirsty dogs, too; they can drink gallons of water day. If your pet hasn’t had sufficient fluid intake, this can cause dehydration, which can cause excessive drooling. Although not specific to the English mastiff, distemper, dental trauma, salivary gland infection and motion sickness are common causes of excessive drooling. If you can’t find a reason for your dog’s excessive saliva production, take him to see the veterinarian, who will investigate these common causes and other possibilities. What Do You Use to Clean out an English Bulldog's Wrinkles & Ears? Are Olde English Sheepdogs Hard to Care For? What to Expect When Adopting an Adult English Bulldog?